On 27 March, Essex Libraries celebrated the grand opening of brand new children’s library space and family hub within Chelmsford Library. Chelmsford is the first city in Essex and the administrative centre for the county. In 2017 we were very fortunate to secure funding from two major funding streams - the Community Infrastructure Levy (Chelmsford City Council) and the Library Opportunities for Everyone Innovation Fund which is managed by Arts Council England on behalf of the DCMS and Libraries Taskforce. 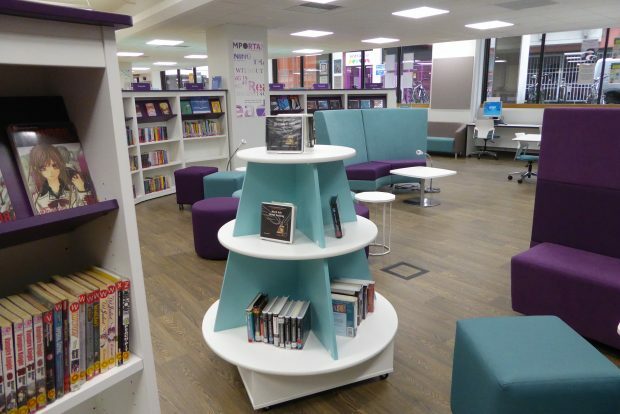 This gave us a unique opportunity to realise our long held ambition to develop an innovative, inspirational children and young people’s space within Chelmsford Library. Essex Libraries are working in partnership with Essex County Council’s Child and Family Wellbeing Service and their contracted delivery partners Barnardo’s and Virgin Care Limited. Together we wanted to create a space that would enable library staff and Family Hub health and childcare staff to work together to ensure that the community have access to a full range of services which support children’s learning, health, wellbeing and cultural enrichment. This process started with a team of staff from the Family Hub and from Chelmsford Library working together to select the designs, furniture and flooring, colours and styles. The work was then undertaken by Mitie Group PLC, Storm and F.G. Library and Learning. Our plans for the space support Essex County Council's strategic direction towards integrated, accessible services and are underpinned by the national Public Library Universal Offers and ASCEL’s Children’s Promise. Early on in the planning process we agreed what we wanted to achieve in the space. This included an emphasis on celebrating reading and literacy; support for health and wellbeing and healthier happier lives - from pre-natal advice to information and advice for families on parenting and health issues. We aimed to improve children and young people’s access to learning and digital literacy and to create a space that will allow us to develop our cultural offer for children. We wanted the library and family hub to engage children from their earliest years and play a vital role in their learning and development as they grow up. So after all the planning we now have our beautiful new space. The first thing visitors will experience as they come into the library is the welcoming feature entrance complete with lighting and shelving enabling us to entice children by promoting new books. The flooring demarcates different zones – darker flooring for a health and wellbeing area for parents and carers – a quieter space away from the hubbub and also for the young adult area. This is already proving popular with books, study areas, comfy sofas and plenty of USB ports and sockets. We chose soft colours that are calming for children, wipe clean flooring, dimmable lighting and a number of autism-friendly features. There are cubby holes where children can curl up among the shelving, a performance area with staging, a wonderful sensory wall and a chill out corner. Light tubes throughout the library provide a sense of calm. It has a remodelled meeting room for 1-21- and small group meetings. It has a sink and an accessible toilet. It has a beautiful sensory wall and with cubby holes where children can curl up to enjoy the lights. Around the pillars are panels containing inspiring reading quotes designed by artist Jacqueline Seifert and inspired by workshop she held with children in the library before Christmas. 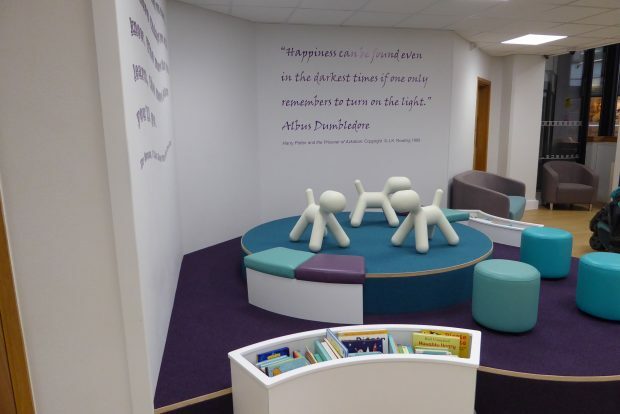 We are thrilled with our new Library and Family Hub and we hope that the project will allow us to create an integrated offer delivering on the shared outcomes of the two services in a way that is truly transformative for our families. It was so exciting watching children starting to explore the space in the week it opened. 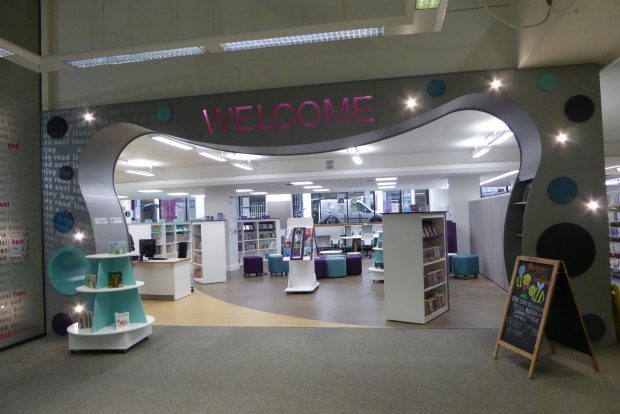 Follow @EssexLibraries on twitter or on Facebook to find out what is going on in their libraries, and take a look at Chelmsford library on the Essex libraries webpages.